The devil lives here. All the older inhabitants of our little town say so. They say on winter nights you might catch his shadow in the moonlight as he stands at his window, looking out. Many years ago, they say, he came to this town, with all his wickedness and schemes. Many fell to his temptations before he was captured in this haunted dwelling, just on the edges of the town. They will not tell you how he was captured, or how many sacrificed themselves to weave the web. They only say he is there, to this day, looking out. They tell all the children of the town, when they are old enough to understand, to make certain none will linger close to his home, see him, speak with him, give him the time of day. Should anyone converse for too long the spell may break and he may be free. I saw him once, on a particularly moonlit night. I was drunk, and galavanting out in the outer reaches of town, looking for such adventure as never finds its way to these quiet, pious parts. And I admit I was tempted. Tempted to speak, to draw him out, even to set him free. The devil in this town again might wake it up, give it colour. What are we, after all, without our shadows? How can even light be light without the dark as contrast? And I am young, and eager for life in all its forms. So the devil lives here, they tell me, and I am not afraid. I fear more days upon days of nothingness – of piety and cloying goodness. I want to embrace everything. And so I plan to leave this place, and they must let me go. They must let me go, even if they do not know, do not understand. Because if they don’t, I’ve seen him, the devil in his woven web. And so either I will be free, or he will be. Either way, I will embrace life. I will. 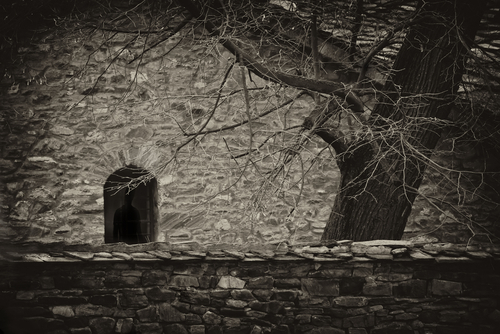 This entry was posted in Horror Flash Fiction and tagged dark, devil, fear, flash fiction, Horror, horror flash fiction, life, small towns, spells, threat, yearning. Bookmark the permalink. Aren’t we all tempted to misbehave when we think things are too quiet? Good one.